BMW M4 Boot Space, Size, Seats | What Car? Drivers of all shapes and sizes will be comfortable behind the wheel of an M4 coupé; there is plenty of shoulder room across the cabin. However, the centre console is a little cluttered when compared with, for example, that in the Mercedes-AMG C 63 Coupé – and it gets worse when the M4 is specified with a manual gearbox. The rear seats in the M4 Series are far from being a token gesture towards practicality. Even six-feet-tall passengers will be able to clamber in easily enough, thanks to the wide doors and front seats that slide far forward and out of the way. Once inside, there's a surprising amount of leg room, but the sloping roof means your passengers will have to slouch to stop their heads from brushing the ceiling. There’s only room for two in the back – with the space between them given over to an armrest. As standard, the rear seats in the M4 split and fold 60:40. Once folded down, the backrests sit at a slight angle rather than fully flat, and the parcel shelf is fixed so that there's a restriction on the height of objects you can fit into the boot. 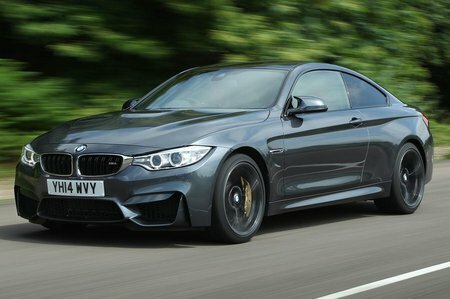 Among saloon-based competition, the M4’s boot is on a par with similar rivals such as the Audi S5, but is bigger than a Mercedes-AMG C 63 Coupé’s. The boot's wide, square shape makes it relatively easy to load, but there is a deep lip so heavier luggage needs to be dropped (rather than slid) inside. With the rear seats down, there's even more room, and the rear passenger footwells double up as extra storage. While there's enough head and leg room for a couple of tall adults in the front of the Convertible, a pair of adults will struggle more for space in the back seats with the roof closed. Shoulder room is tight and their knees will likely be touching the front seat backs, especially with a tall driver. With its air deflector in place, the M4 Convertible effectively becomes a two-seater. Boot space is also limited. Roof up, the Convertible offers 370 litres, but should you want to fold it away, that's reduced to a short, narrow 220 litres. That's enough for the weekly shop on a rainy day, but barely enough for a suitcase on a sunny one. It's also disappointing that the folding rear seats that leave a narrow opening through to the boot costs extra.